Tetherballs and tetherball posts bring fun and non-contact competition to kids on your playground! Our posts come in two designs: a two-piece post, which ships by UPS and may be ordered here online, or a single-piece post, which ships via motor freight. This product may be ordered separately from the post, and it ships via UPS. 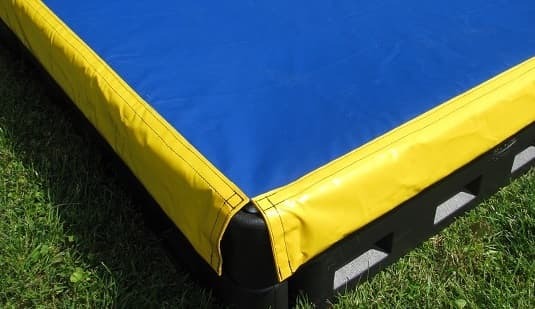 Both the tetherball and the post are manufactured by SportsPlay, Inc., a leading playground equipment manufacturer. Give your kids the game that “Napoleon Dynamite” made you love again. Our official tetherball is made from 5-ply rubber covered ball. The bladder is made from nylon-wound butyl. 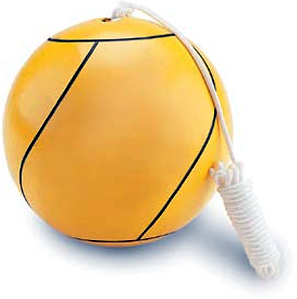 The ball has a recessed metal reinforced hanger with a white nylon cord. It ships by UPS. Note: This item is the tetherball with the attached rope. It does not include the tetherball post (available below). 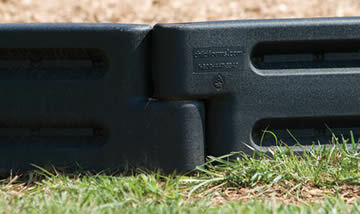 • two-piece post (Unit# 571-110-2; ships via UPS). Weight: 40 lbs., Price (for either type of post): $205.00 + shipping. Note: Tetherball is sold separately.